The SRAM Automatix two-speed hub, currently available as of this writing in 2016, has received good reports for reliability. While Sturmey-Archer two-speeds are shifted by backpedaling, the Automatix uses centrifugal force to shift it at a particular speed -- and so, the hub doesn't annoyingly shift every time the coaster brake is used. The gear ratios are 1.00 and 1.36 (64/47), as with the old Sachs Automatic and Duomatic hubs. SRAM reports that several versions are available, with coaster brake, or to fit a disc brake rotor or Shimano Rollerbrake, also with an aluminum shell -- see SRAM page. The coaster brake version weighs about twice as much as the others, but then it includes a brake. The sprockets are the standard three-lug ones as used with most internal-gear hubs, but a Gates belt-drive option is available. The Automatix is relatively simple and easy to service, though as usual with SRAM geared hubs, parts availability in the USA is an issue. User Instructions are available online, but as of this writing, no rebuilding instructions. 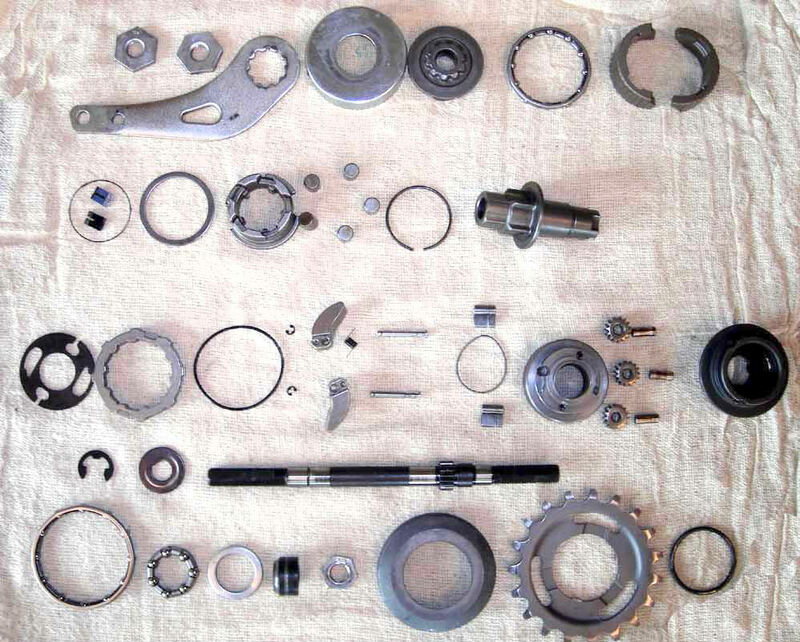 Aaron Goss of Aaron's Bicycle Repair, Seattle, Washington, USA, rebuilds these hubs and has been kind enough to provide the helpful photo and diagram below. The speed at which the hub shifts may need adjusting. That is relatively easy to do, though it requires disassembly of the hub -- also see below. The SRAM Automatix coaster-brake hub, disassembled. center of picture. Yes, that is correct! That article includes lots of additional helpful information about the hub. The Automatix is available with 28 or 36 spoke holes. The shift point with 36 holes is around 135 RPM, or 10 mph (16 km/hr) on a bicycle with a 26" wheel. Apparently, the version with 28 spoke holes is intended for smaller wheels and shifts at higher RPMs. This version is reportedly rare, and 28 spokes aren't a good idea on a utility bike with large wheels. Another way to raise the shift point would be to install the internal mechanism from a 28-hole hub into a 36-hole shell, but with small wheels an adjustment would be needed even with the 28-hole version. Perhaps installing a spring behind the second flyweight would also raise the shift point -- though you would then have to acquire a second spring. Removing one of the flyweights also might work, as long as the resulting imbalance doesn't prove to be a problem.